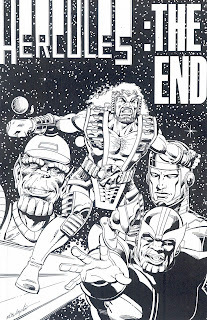 "Originally, Marvel's Editor-In-Chief rejected this cover to the conclusion of my mini-series, stating that if I had an issue starring a character as popular as Galactus, having him on the cover would probably sell more books than Frankie Raye's glowing hand. In retrospect, I'm inclined to agree since this turned out to be one of the most well-received stories of my career." "I just found this presentation piece while combing though some old boxes one weekend. A few years back, when I was still working for Marvel, I pitched a premise for my final Hercules mini-series and I did this drawing to go with the document. Obviously, Marvel didn't go with it (in fact, they never even bothered to respond). The story revolved around a humorous look at death and dying--something I thought might be appropriate for their "The End' series." 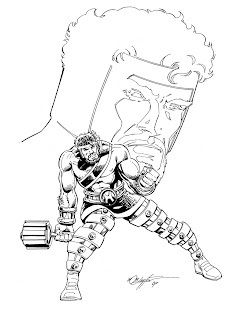 This Hercules miniseries was Bob Layton’s first writing job and he succeeded in bring this character out of the shadows where most second-stringers find themselves. Interestingly, this miniseries was the first that Marvel Comics had put out and its success paved the way for what is now an industry standard. The current Incredible Hercules series owes a lot to those 1980s miniseries as it solidified Hercules’s brash, impetuous, and fun-loving nature. 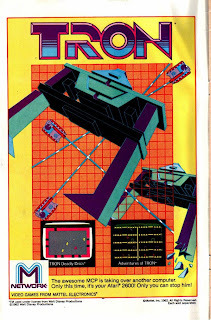 This miniseries was my first exposure to Layton which prompted to catch up on his Iron Man run and get in ahead of the crowd on Layton and Michelinie’s Iron Man – Armor Wars a few years later. In much the same way as Thor was exiled to Earth as Dr. Donald Blake, Zeus exiled his son to deep space in hopes that Hercules learns humility. He's joined along the way by a robotic Rigellian Recorder who is eager to witness the god's adventures and serves as the perfect straight-man for this comedy duo. “I loved the big dumb lug. And I felt that he hadn't found his niche' in the Marvel Universe, being relegated to supporting roles and such. Also…I felt that the Marvel books took themselves WAY too serious in those days. I wanted to lighten things up a bit. The only problem was convincing the parties involve that poking fun at the Marvel Universe wouldn't do permanent damage to it as a whole. What is so fun about this miniseries is how it captures the essence of being human through a demigod. While Hercules is a “big dumb lug”, you can’t help but find him a sympathetic character that you cheer for along the way. It’s also his good nature that hits home and reminds you to enjoy life and have fun. At the same time, there are thought-provoking moments on immortality and on the destructive effects the Olympian pantheon has had on Earth. 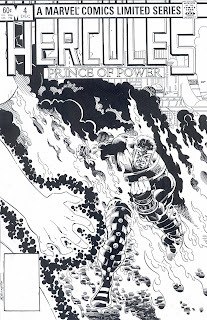 The Hercules: Prince of Power Premiere Edition is still in print and reprints both the 1982 and 1984 miniseries. 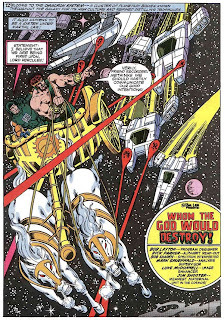 A new series, to be written and drawn by Bob Layton and Ron Lim, based on this future world, Hercules: Twilight of a God is in plan, but has yet to be scheduled. With waaay too many comic books in my basement, I started the laborious process of culling my back issue stock. Coming across the Wolverine box, I thought that parting ways with the old Goodwin-Byrne storyline might be easily done. However, as I read these issues, I was quite impressed by the story telling. Wonderful and spot-on characterization of Wolverine and an action-adventure story that would make James Bond proud contributed to me putting this run back into the box. And more than that, it convinced me to write about it. The story drags Wolverine from Madripoor to South America where he inadvertently becomes part of a revolt against a military dictatorship. This dictator has hired Geist a robotic scientist to create a super soldier for him. While the run might have been trimmed by an issue, it was a solid effort and ranks among some of my favorite Wolverine moments. The wrap-up of the storyline is want impressed me the most. It played me wonderfully, pulling me in on direction and pleasantly surprising me. Also of note was that this run was during the Acts of Vengeance cross-over. And of course, Wolverine had to be pulled into this event. However, the unlikely battles between Wolverine and Tiger Shark proved to be entertaining. Not to mention the fact that Wolverine could actually die underwater made their battle that much more interesting. Byrne did the breakdowns on these issues with a bit too much of Janson’s style coming through. His inking work tends to be naturally heavy, so with him doing the finishes, more of heavy cross-stitching of the inks are apparent and distracted my eye. It might just be that their styles crossed as I genuinely like Janson’s work, especially on Miller’s DD. 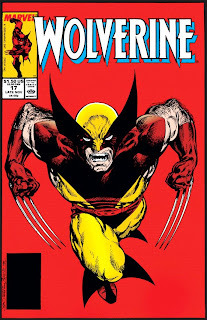 This run can probably be found rather easily in the dollar bins these days or you could pick up the Essential Wolverine #1 which reprints issues #1-23. 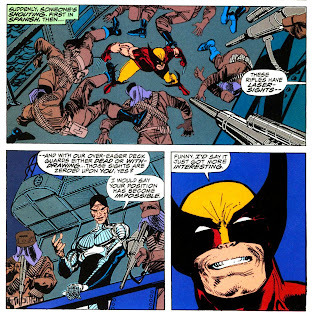 While the letter page in issue #22 suggests that Byrne would pencil a few more issues of Wolverine, it didn’t happen. 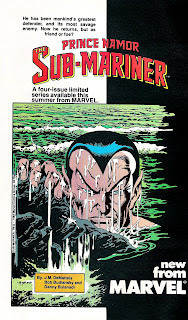 Byrne would move on to writer and pencil the relaunch of the Sub-Mariner’s 1990s title. This miniseries was a mediocre effort that resulted in one thing: freeing Namor of his Atlantean responsibilities. In the aftermath, Namor rejoined the Marvel Universe without the baggage of Atlantis. Roger Stern had Namor join the Avengers. In 1990, John Byrne revamped Namor with a fresh 90s feel and succeeded in breathing new life into this golden age hero. But back to the miniseries. An irresponsible and bored Namor learns an important lesson in responsibility. 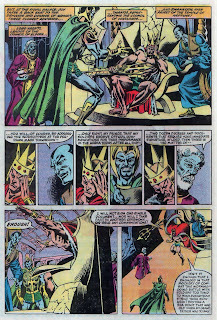 However, before he's able to act to undo his wrongs, his decisions are taken out of his hands and he's forced to abdicate the throne of Atlantis. The plot seems a bit contrived in that each time Namor made an attempt to deal with a problem he'd be sidetracked by a subplot. Namor was never really given a chance to make his own decision and from a character perspective that really weakened the story. Budiansky's panel layouts are awkward and the art itself is visually dull, but there are a few glimpses of good solid artwork. The panels are too cramped and are distracting with awkward point of views. 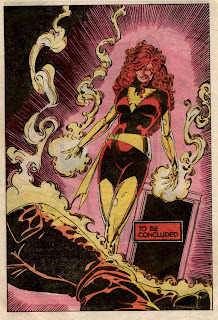 Unfortunately in late 1985, Jim Shooter approved the Return of the Phoenix story line that reunited the original X-Men and resurrected Jean Grey. The blame for bringing back Jean Grey has passed between John Byrne, Chris Claremont, and Jim Shooter like a hot potato. In 1999, Kurt Busiek stepped forward and accepted the blame. Claremont didn't like the idea at all and approached Shooter. However, according to Claremont, Shooter “felt the marketing arguments in favor of resurrecting Jean far outweighed what I felt was the critical damage being done to the canon”. 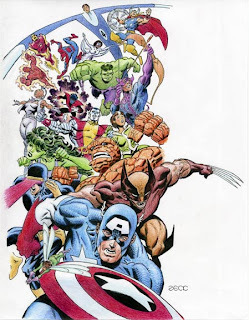 “I have to give the credit/blame to John Byrne. In the initial premise that Jackson Guice and I submitted, Jean Grey was not part of the group. Mike Carlin, editor at the time, pulled me aside one day and said "Hey, how would you like to have ALL of the original X-Men back?" “When Jackson Guice and I were developing the series, Jean Grey was still stone-cold dead. Since we knew we would have to have the "babe factor" in any Marvel X-men series, we made the decision to draft Dazzler as Marvel Girl's replacement. As you can see in the version posted here (one of the seven covers that Jackson and I designed that were later rejected) we deliberately left the central female figure blank. 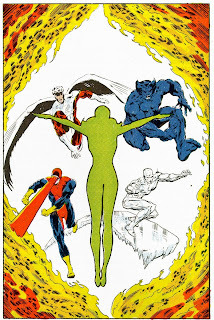 The magic explanation was that Jean Grey had been put into suspended animation by the Phoenix entity just after X-Men #101 and was then impersonated by this entity who had copied her soul. It was this entity that destroyed herself in X-Men #137 and not Jean Grey. Was bringing Jean Grey back a mistake? In my opinion, absolutely. There's no question that this was a bad idea, but financially Marvel couldn't pass up the opportunity to make wads of cash. They compromised one of Marvel's greatest story lines to make money. Angel, Iceman, and Beast have historically had problems outside the X-Men, with perhaps the only exception being Beast as an Avengers. But, they weren't able to do much on the Champions or Defenders as both series were canceled. The biggest casualty in bringing back Jean Grey wasn't Jean, but rather Cyclops. Scott Summers was portrayed rather pathetically in that he abandoned his wife and child to go gallivanting around with an old flame, with whom he avoided mentioning that he was married. While I have to admit it was fun to see the original X-Men together horsing around, Iceman and Beast hanging out together, and setting up that familiar love triangle between Angel and Cyclops. But, I wonder if they would have been better off setting up Angel with Jean and reuniting Cyclops with his wife? With that said, the basic idea behind X-Factor was a clever one. Taking advantage of mutant hysteria to locate mutants under the guise of a mutant-hunting organization was a solid premise that was a new take on Professor X’s dream. In Byrne’s first pass on Fantastic Four #286 (original pages seen in the Phoenix Rising Premiere HC), the Phoenix entity was seen as more of a malevolent being out to destroy everything. A last ditch effort by Jean somehow imprints her soul on the entity forever changing it. However, that approach didn’t sit well with Shooter and Claremont was asked to step in and do a re-write. The re-write changed the Phoenix force into more of a benevolent being who genuinely wanted to help Jean as she was about to sacrifice herself to save her teammates. And speaking of Fantastic Four #286, it’s a wonderful issue highlighted by the reunion of John Byrne and Terry Austin. No one inks Byrne like Austin. While I've covered the actual miniseries in another post, I thought I'd share some new images I found. This first image was a promo drawing done by the legendary John Romita Sr. Absolutely love this picture. Looks like the black space would have been where the logo or advertising blurb would go. 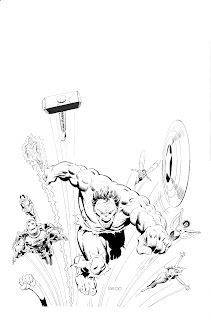 This image is the unused cover to Secret Wars #6 by Mike Zeck in favor of the Bob Layton drawn one. The one thing of note on the Zeck cover is the appearance of Kang who was "killed" by Ultron by this point in the miniseries. 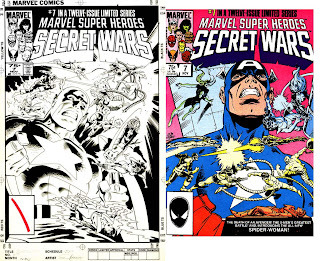 Similarly, this image is the unused cover to Secret Wars #7 by Mike Zeck in favor of the Bob Layton drawn one. The one glaring difference is the appearance of Spider-Woman on the Layton cover. 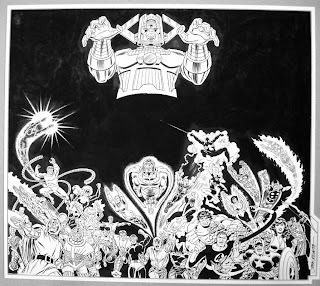 This image looks to be a water-coloured drawing by Zeck and could have been part of an ad or something as there's some space left blank on the right side of the image. Paul Smith will always be one of my favorite X-Men artists despite having only drawn eleven issues. His unique style, that oddly seemed both simple and detailed, captured defining look for the X-Men. 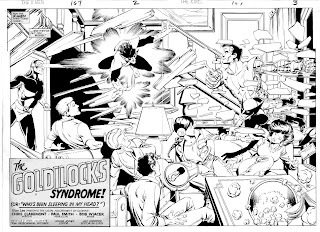 Bob Wiacek’s inks were well balanced with Smith’s pencils and their end product rivaled the work of John Byrne and Terry Austin. 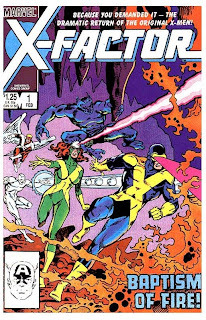 Paul Smith’s relatively short run on The Uncanny X-Men revitalized the series and sparked Chris Claremont’s storytelling and creativity as writer. When the Brood saga was wrapped up, Claremont steered away from the multi-issue story lines. Plotting wasn’t Claremont’s strength and it suffered without Byrne’s collaboration. To his credit, Claremont did turn to his strength: characterization. Rather than set a plot and have his characters go through the paces, he focused on the characters and had them drive the action. Writing a team book didn’t seem like an ideal place to focus on characterization; however, Claremont pulled it off. While he juggled the cast of characters he also took the time to put characters into the spotlight. Claremont was obviously keen on Storm, a young woman with mutant powers that allowed her to control the weather. She went through a slow, unfolding character development that actually spanned several issues. Her life, like any in the real world, was constantly changing. Claremont’s characters evolved as events in their life changed their perspectives. Storm went through an intense period of inner turmoil until she drastically adjusted her identity to deal with her new responsibilities as X-Men’s leader. She changed from a soft, innocent girl in touch with Mother Nature to a tough, confident woman with a Mohawk and wearing leather. Claremont also devoted a lot of attention to Kitty Pryde. My early impression of Kitty was that she filled the role of team sidekick. She was a bumbling kid who was often used as comic relief. However, The Uncanny X-Men #168 marked a turning point in this character’s life. Professor X decided to “demote” her from the X-Men so she could join the New Mutants and be with kids her own age. However, Kitty proved to Professor X that she was no longer the naive thirteen year-old kid that she had been when she joined the X-Men, but was becoming a young woman that had earned her place among the X-Men. To check this, I flipped back through a dozen or so issues of the X-Men and realized that Claremont had been letting this character grow and become a young adult. During this run, Marvel launched a spin-off title called The New Mutants featuring a group of young kids who would be the next generation of X-Men. Claremont’s writing never suffered from juggling both The Uncanny X-Men and The New Mutants. This new series marked the X-Men family of books and the beginning of a broader X-Universe. Wolverine’s popularity continues to soar and earned him a four-issue miniseries. This year also saw the X-Men add to their roster. Rogue, who made her debut in Avengers Annual #10 sought out the X-Men to help her control her mutant ability. She was cursed with the power to absorb a person’s powers, thoughts, and memories with the slightest flesh contact. She was reluctantly allowed to join the X-Men, but quickly earned her place. 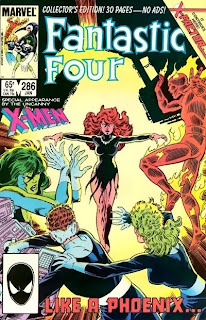 The year’s final next story line introduced a young woman named Madelyn Pryor who looks exactly like Jean Grey. Scott (Cyclops) Summers fell in love with her and learned that she’s the sole survivor of a plane crash that occurred on the same day that Jean died. As it turned out, their old foe Mastermind used his illusion generation powers on Madelyn and made her the reincarnation of the Dark Phoenix. Once the dust settles, Scott finally came to terms with his grief for Jean and married Madelyn. Issue #175 was Paul Smith’s last issue and the first X-Men issue for John Romita Jr who would really make a mark for himself over the next couple of years. The year started off inconspicuously without any hint of what would be coming our way in a couple of months. Amazing Spider-Man #236 wrapped up the Tarantula/Will ‘O Wisp storyline. 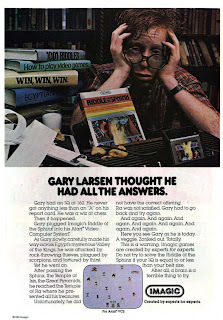 I’ll cover that story arc in my 1982 writeup. Issue #237 was a mediocre fill-in issue written by Bill Mantlo and drawn by Bob Hall and Frank Giacoia. However, everything changed with issue #238. Amazing Spider-Man #238 turned out to be the most important issue of Spider-Man of the 1980s. 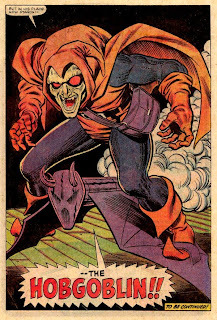 It featured the first appearance of the Hobgoblin and set into motion the first Hobgoblin storyline that would keep readers trying to guess his real identity. This issue featured the classic art team-up of John Romita Jr. and John Romita Sr..
Amazing Spider-Man #238 was a great jumping on point for new readers. Roger Stern, approaching the peak of his run on the title, weaves a wonderful story that brings out Peter Parker’s character with a distinct voice that I still identify with my favorite Spider-Man. Stern always did a good job balancing Peter’s supporting cast and making them seem far more real and playing stronger role than the usual card-board cut out secondary characters. Amazing Spider-Man #240-241 have Spider-Man cross paths with the Vulture once again. The Vulture is one of Stern’s favorite Spider-Man villains and focuses on the battle between age and youth. The Vulture is finally given an origin after being around for 20 years. 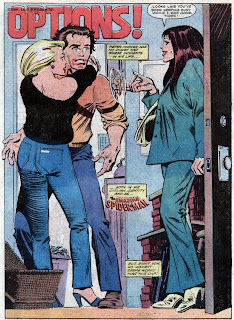 Stern and Romita Jr. bring back Mary Jane Watson in issue #241 and introduce a new love triangle for Peter Parker as he’s already started something with Amy Powell, seen in issue #242. Peter makes one of the biggest decisions in his life in issue #243. Despite being accepted into the graduate program, Peter quits school. Issues #244-245 have Spidey tried to find the Hobgoblin. 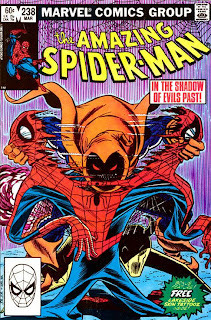 In issue #245, the Hobgoblin draws out Spider-Man and he’s unmasked as Left Donavan. However, he’s killed and Spidey knows that he wasn’t the real Hobgoblin. Amazing Spider-Man #246 is a great, off-beat issue that releases a bit of tension that was setup in past few issues. This story wanders through the daydreams of J. Jonah Jameson, the Black Cat, and Peter Parker. 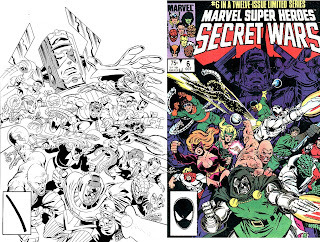 Issue #247 is an artist treat with pencils by John Romita Jr and inked by John Romita Sr.
Interestingly, J.M. Straczynski’s run on Amazing Spider-Man was very reminiscent of these issues, especially since both runs feature the art of John Romita Jr. It’s interesting to see the development of his artwork from emulating his father’s classic Spider-Man style to defining his own style. His artwork back then seems a bit more stylistic and heavily influenced by his father, especially with a great senior inker like Frank Giacoia. This issues inked by Dave Simons seem a bit sloppier and not as refined. The Stern-Romita Spider-Man run will always be my definite Spider-Man. The more mature Peter Parker seemed to be where I liked the character the most. Stern spent a lot of time developing Peter’s supporting cast and did a lot of great things with them. In 1983, Marvel launched a series of prints using the then high-quality Baxter paper under the label of "Special Editions". Even by today’s standards, these reprints are exceptional and can be found rather cheaply in back issues bins. In most cases, these Special Editions included new wrap-around covers as well as pins by some of the best 1980s talents. 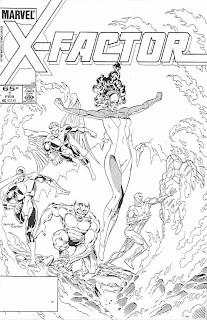 I fondly recall picking up the X-Men Classics and re-reading those wonderful Neal Adams issues featuring the Sentinels, Sauron, and the Savage Land. In some cases, these reprints weren’t complete and some new material was inserted to bridge the story. See the following list for complete details: http://www.freewebs.com/marvelreprints/mv_edition.txt. - Reprinting Strange Tales #178-181 and Warlock #9-15, Marvel Team-Up #55, Avengers Annual #7, and Marvel Two-In-One Annual #2. - Reprinting #57-63 by Roy Thomas and Neal Adams. - Reprinting: Giant-Size X-Men #1 by Chris Claremont and Dave Cockrum and featuring an original 10 page Kitty/Illyana story. Reprinting Marvel Preview #11 by Chris Claremont, John Byrne, and Terry Austin. - Reprinting Backup features in The Rampaging Hulk! 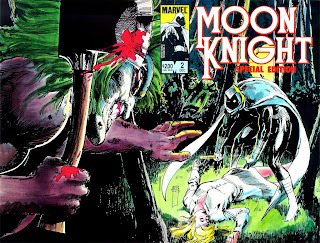 #13-15,17-18,20, by Doug Moench and Bill Sienkiewicz. - Reprinting Captain America #110-113 featuring art from the legendary Steranko. - Reprinting Strange Tales #130-141, featuring art from Steve Ditko and outstanding wrap-around covers by John Byrne. - Reprinting Daredevil #168,174-181,190 (Bizarre Adventures #28), by Frank Miller and Klaus Janson. 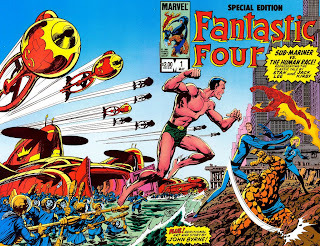 - Reprinting Fantastic Four Annual #1 by Jack Kirby and Stan Lee. 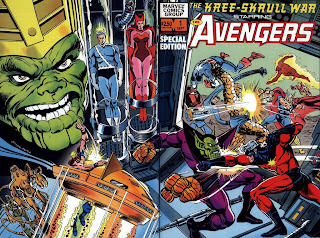 - Reprinting Avengers #93-97 by Roy Thomas, Neal Adams, and John Buscema. Reprinting Nick Fury, Agent of SHIELD #1-5, by Steranko. 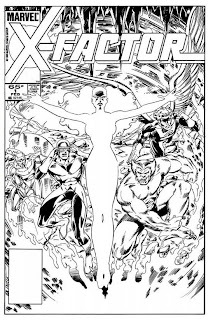 - Reprinting The Uncanny X-Men #137 by John Byrne and Chris Claremont with unpublished alternate ending. - Reprinting Peter Parker the Spectacular Spider-Man #26-28 by Frank Miller. - Reprinting Iron Man #55 and Captain Marvel #25-34 by Jim Starlin. 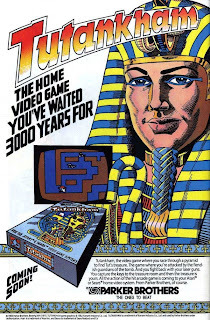 Here's to a wonderful year of remembering of the fun we had in the 1980s. And of course for more strolls down memory lane in 2010!